To divorce her husband in absentia or to waive her house, were the only two solutions for a Syrian lady to get out of the labyrinth she was put in. Mariam A., 39, used to live in Ariha city, located in Idlib province, along with her husband who is a conscript in the Syrian regular forces, the thing that forced him later to flee to Damascus after Jaish al-Fatah managed to control Ariha in 2015, as he was a military adversary. After Jaysh al-Fateh’s takeover, Ariha witnessed violent aerial bombardment, which produced a large number of displaced people including a lady who fled to Kafr Nabl, an adjacent town. After the bombardment stopped, she returned back along with her children to her two-room house, but she was shocked to see a family of al-Nusra Front fighter residing there. They told her that the house was confiscated because her husband was one of the Syrian regime’s Shabbiha. It was almost three years since the incident, during which Jaish al-Fatah was dissolved, as al-Nusra Front separated from it, and changed its name to Jabhat Fateh al-Sham and then to Hay’at Tahrir al-Sham(HTS) after its separation from al-Qaeda. However, what has not changed is that Mariam lost both her house and husband. 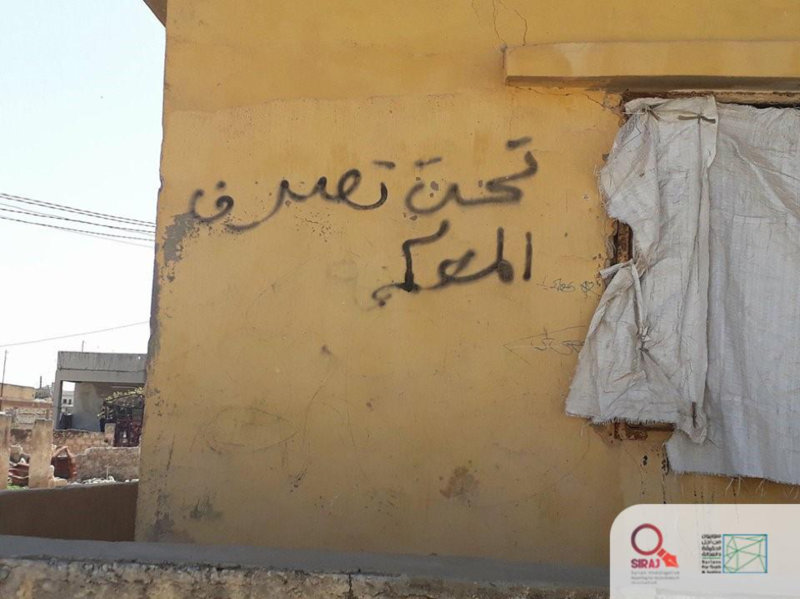 Mariam was not the only one whose house was confiscated; as the writer of this report counted the confiscation of 46 houses, throughout Idlib province, between 2013 and 2018 by HTS (formerly al-Nusra Front) and Jaish al-Fatah before it. She got this information through interviews, with persons whose houses were confiscated, and field visits, with a direct survey in several towns and villages of Idlib. 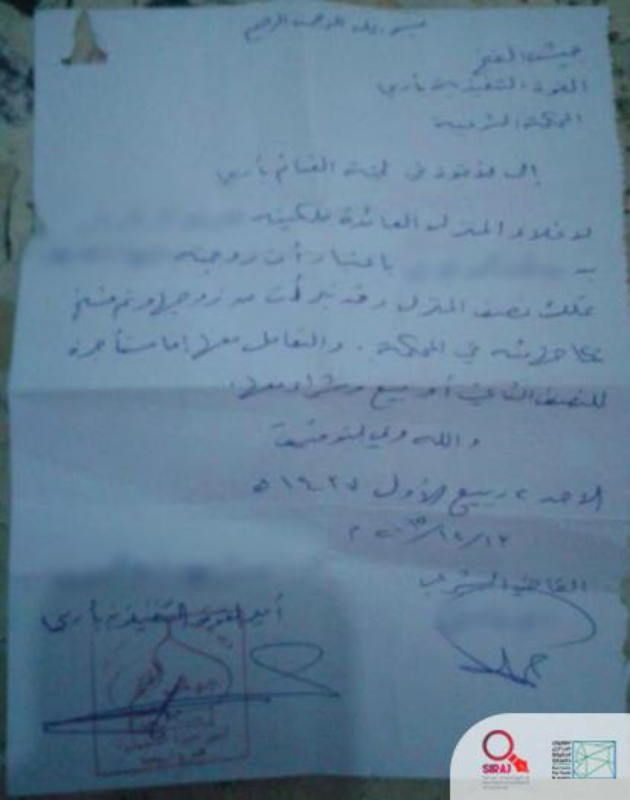 This six-month investigative report showed that HTS used two pretexts to seize people’s houses, where it either accused the person of being “Shabih” or an “apostate” without legal warrant. 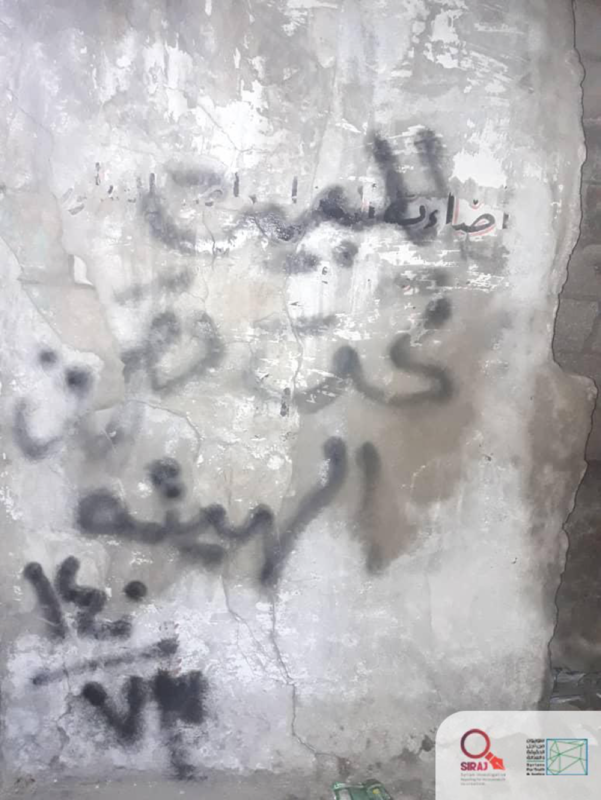 It was enough for the members of the Sharia Court or the judiciary, affiliated to HTS to write, “seized” or “at the disposal of the Sharia Court” on any house to confiscate it. From here, the legal owner of the house starts his long journey in courts to get it back. However, most of the civilians interviewed, failed in getting back their houses due to the lack of impartiality in HTS courts, since the entity that seizes the house is the same that took office, besides the lack of competence of HTS’ court judges, according to homeowners and eyewitnesses from the same area. This rule applies to non-international armed conflicts, such as the Syrian conflict, and applies also to the members of non-state armed groups, like HTS, according to a written response obtained by the preparer of this investigation from STJ, an independent human rights organization works to document human rights violations, stating that the seizure of houses and other properties of Idlib residents by HTS is a breach of its obligations as a party to the conflict and a clear violation of the International Humanitarian Law (IHL). After confiscating her house, Mariam never gave up. She started asking Jaish al-Fatah Sharia Courts for assistance to get back her house, which is the only shelter for her and her children. She headed to the court and told them that she had a legal contract of sale between her and her husband, which proves her ownership to half of the house, but judges there refused to give her back the right to dispose of the house. However, because of her insistence on getting back her house, the judges suggested that the problem could be resolved by getting divorced in absentia in exchange for giving her back the right to dispose of the house. She refused to do so at first, but then she changed her mind because of two reasons; first, she wanted to get back her only shelter, and the second losing hope to reunite with her husband who was in Damascus, as she told the presenter of this investigation. By the end of 2015, months after the confiscation of Mariam’s house, she stood at Jaish al-Fatah court and divorced her husband in absentia by a document signed by the judge, who in turn, wrote an eviction order to the new residents of the house immediately. “Furthermore, the judge issued a note sealed with the stamp of HTS, who chaired the security committee of Jaish al-Fatah faction in Idlib. The note stated; “Mariam has the right to get her house back as she owns half of it and she is divorced lawfully”. It was just the shock when the “al-Nusra Front” fighter’s family, settled in the house, never cared for the judge’s note and refused to leave the house. Nonetheless, no action was taken by the court to force them out. Consequently, Mariam had lost her husband in the first place and her only shelter in the second. At the last interview with the presenter of this investigation, Mariam said, “she will never ever return to this area because she was disappointed there” and then Mariam disappeared, and no one knew where she went. Jaish al-Fatah was formed in March 2015, by the union of seven rebel factions; “al-Nusra Front, Ahrar al-Sham, Jund al-Aqsa, Jaysh al-Sunnah, Faylaq al-Sham, Jund al-Haq, Ajnad al-Sham”. It was dissolved later and that was followed by secede of “al-Nusra Front”, which was one of its most prominent components, from al-Qaeda. Abdulkarim Barbour, who hails from Saraqib city in Idlib countryside, was displaced early in 2013, towards a safe village west of Aleppo as a result of the escalation of the shelling and he still doesn’t dare to return home. Almost three months after displacement, specifically in April 2013, he accidently saw a photo published on the social media of his own house written on one of its walls “at the disposal of the court”. Barbour added that he learnt from friends living in the neighborhood that “al-Nusra Front” rents his house to its Syrian and immigrant fighters in rotation. Barbour dare not sue them out of fear of reprisals, the same fear that had already prevented him from returning home anyway. Therefore, he left his house to its fate. 7 out of the 46 seized houses, which were documented by the investigation writer, were confiscated by charging their owners with “apostasy”. Apostasy is the conscious abandonment of Islam by a Muslim in word, through deed, doubt or loss of faith” according to the Islamic scientific references. Ali Amin as-Suwayed, 49, from Kafr Nabl but living in Kuwait for more than 20 years, was one of those Syrians whose houses were confiscated after being accused of apostasy. As-Suwayed is the writer of the famous signs held by protesters in Kafr Nabl town. On April 28, 2015, he published an article criticizing Abu Mohammad al-Julani, the commander of HTS, which in response accused him of apostasy and confiscated his both houses in Kafr Nabl; knowing that his elderly parents lived in one of these houses and his nephew lived in the other. 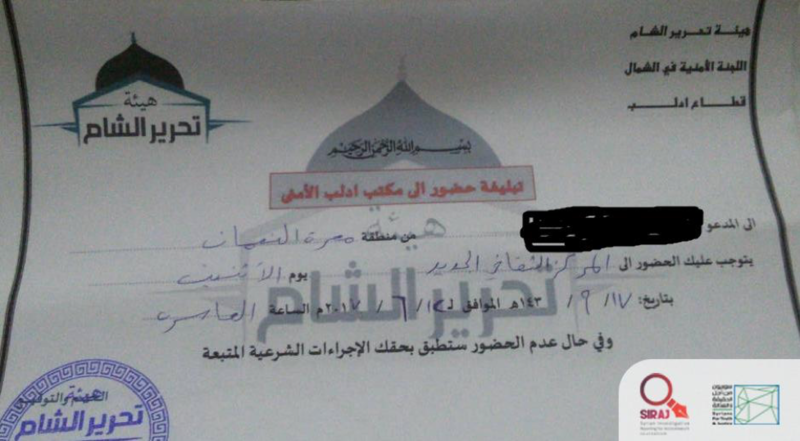 As-Suwayed said: “al-Nusra Front accused me of apostasy and of distributing Takfiri leaflets”. As-Suwayed rejected these charges and said that he is proud of being Muslim. Moreover, he faced “allegations of apostasy” with a massive media campaign that involved several activists from Idlib who refused the charge that was never based on clear evidence. This prompted al-Nusra Front to renounce its decision to confiscate as-Suwayed’s houses to avoid public outrage. However, as-Suwayed added that after al-Nusra Front gave him back the right to dispose of his houses, it arrested his nephew, Bashar as-Suwayed, 23, who was living in one of the two confiscated houses. He has been held for more than 10 months, on a charge of communicating with his uncle, Ali, in order to put pressure on the latter. The Free Idlib Army opposition faction currently controls Kafr Nabl town. However, HTS still has extensive influence over the town and throughout Idlib province. The house of Um Muhammad and her family was saved from being seized by HTS at the very last moments, after the latter sent her an eviction notice. Where on Wednesday, 18 December 2017, a person knocked the door of Um Muhammad’s house located in Ma`arat al-Nu`man city, south of Idlib, and told her that they had to evacuate the house and to go to the courthouse the following day to meet the judge; the man turned to be from HTS courthouse. “When the judge, who was a sheikh, came in, he started asking about my children and their whereabouts; I replied that they were in Hama city, and that one of them is a civil servant at the central inspection, whereas the other is a taxi driver.” Um Muhammad said. The woman was shocked when the judge replied that the court had decided to confiscate her house, arguing that her son was working for the Syrian regime, and that her house had to be evacuated within a month as maximum. Despite all her attempts to persuade him that she has no other place to shelter in, and that her other three children had been killed during previous bombardment on the area, the judge did not alter his decision. 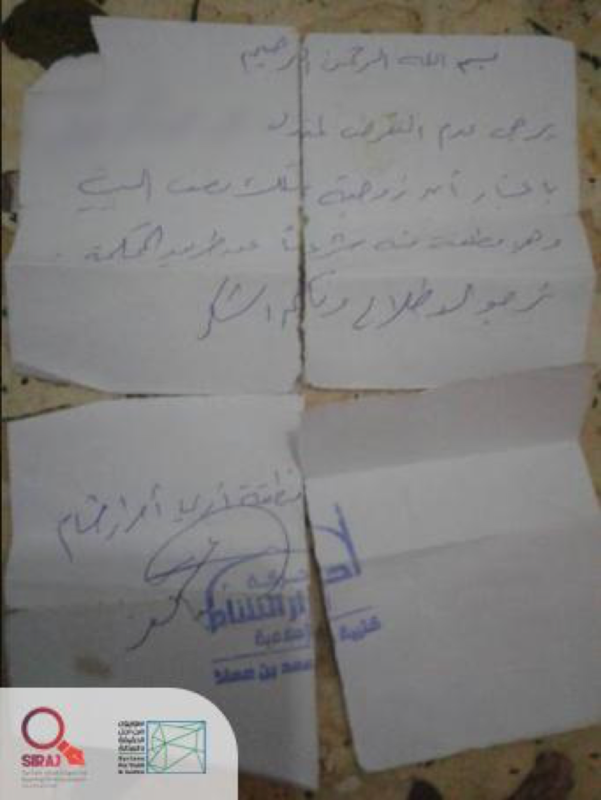 Prior to the expiry of the time limit for the eviction, Um Muhammad contacted a person close to HTS agents to help her asking them to reverse their decision. Indeed, the person, whom Um Muhammad did not disclose his identity, spoke with the Sharia judge at the courthouse to disregard, even temporarily, the confiscation of her house. While mediation was being applied, the two opposition movements; Nour al-Din al-Zenki and Ahrar al-Sham merged in the name of “Syrian Liberation Front” with the aim to fight HTS. Fierce battles erupted in Ma`arat al-Nu`man, and led to withdrawal of HTS from the city, in early February. So, Um Muhammad’s house was saved from being confiscated, but in mid-April, HTS re-took the area, which raised again Um Muhammad’s fears of losing her house. Um Muhammad was not the only person whose house was about to be confiscated by HTS in Ma`arat al-Nu`man. Last June 12, Um Rami, an alias, received a telegram stated that she had to go to HTS courthouse, and when she went there, she was told to evacuate the house she was living in, because it is registered to her son, who is a conscript in the Syrian regular forces. The house was a two-storey building; the woman used to live downstairs with her children, and rent the upstairs to earn a living. The judge told her to evacuate the downstairs, and to tell the renter to pay the monthly rent to HTS instead. Um Rami added that she tried to claim that the house was registered to her but she did not have ownership papers; she also tried to convince them that she was not responsible for her son’s actions, but all her attempts failed. Later the attempts evolved to verbal altercation with the judge, but ended up with the retreat of HTS from the confiscation order, in exchange for paying HTS the monthly rent of the floor she used to rent, which was SYP 10,000. Consequently, Um Rami lost her sole source of income, in the absence of any breadwinner. The lawyer Ghazwan Qurunful, head of the “Free Syrian Lawyers Aggregation”, which is a Syrian rights organization in Turkey, described the legal arbitration process, deciding house cases in HTS courts as “a judicial circus tent”. “Forming such courts is an additional offense, as by creating alternatives of the state courts, the armed factions shall commit an offence of “usurpation the Judiciary”, as the power of the judge mustn’t be exercised by any person”, Qurunful said. “Legally, what HTS agents did is a pillaging property crime, that deprives a person of his right to dispose his property lawfully”, pointing out that it falls under misdemeanors, that there is no transfer of ownership, but just a temporary seizure. Judges of HTS are sharia men, whose scientific qualifications are identities are unclear, as they known by their titles like, Abu Muhammad, or Abu Hajer, etc. Those sharia men were trained to be judges by attending a 15 day course entitled “Preparing a Sharia Judge”, according to Ahmad Bakour, the Syrian lawyer who was living in Idlib. The Minimum guarantees in criminal proceedings are determined by article 14/3 of the International Human Rights Law, which stated that the charged must be informed promptly and in detail in a language which he understands of the nature and cause of the charge against him, have adequate time and facilities for the preparation of his defence and to communicate with counsel of his own choosing; be tried without undue delay; be tried in his presence, and defend himself in person or through legal assistance of his own choosing and not to be compelled to testify against himself or to confess guilt. HTS courts are void since they do not apply the standard guarantees of the International Human Rights Law, according to Syrians for Truth and Justice (STJ). We presented our facts to the Ministry of Justice in the “Syrian Salvation Government”, being the only civil rights body in Idlib province. * This investigation was carried out under the supervision of the Syrian Investigative Reporting for Accountability Journalism-SIRAJ, in cooperation with Syrians for Truth and Justice (STJ). Supervised by: the colleague, Ahmad Haj Hamdo.